The holiday cottage is a traditional 3 storey Cornish cottage, centrally situated close to Place, St Fimbarrus church and only 300 yards from the Quay, harbour and shops. 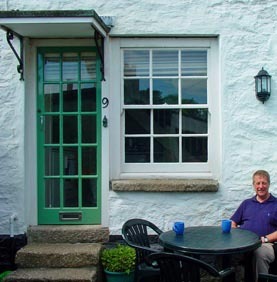 Together with views over the estuary, town, and countryside, the cottage benefits from onsite parking. Well maintained, the cottage has been completely modernised and is comfortably furnished with full central heating, making it ideal for a winter holiday. The door to cottage is accessed by 3 stone steps, this opens into a tiled floored kitchen, a carpeted staircase runs from here to the sitting room, which has wood laminate flooring, a second carpeted staircase leads to 2 bedrooms which have wood laminate floors and a tiled floor bathroom with shower over bath.